We recently had the opportunity to try out a new product line from Little Tikes called TikeStix. 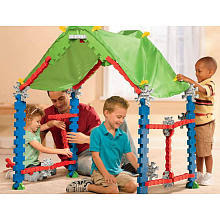 Described as an all-new dynamic line of indoor and outdoor construction toys built for kids that promotes innovative ways of toy building play. From forts and racecars, to aliens and petting zoos, Little Tikes TikeStix™ is designed to encourage a child’s imagination and creativity, while teaching motor and project-building skills. Being an all boy household, we chose the Clubhouse kit. It arrived and immediately the boyz set to work. It comes with an easy instruction booklet with pictures, as opposed to words. So easy for even the littlest ones to understand and be successful. Also, be sure to save the box to house all of the pieces! They really enjoyed working together! 3 year old to work with! All da boyz, including Daddy D, hard at work! I love the teamwork aspect of this toy! Happy Boyz in their fort! Gabe & Eli worked together to make another suggested item, the pirate ship. They even added their own sail using the tarp and clips. This kit gets two thumbs up from the D family! We can’t wait to add more to the set and let the boyz create bigger things! I’m also happy to be giving away a Little Tike TikeStix set to one lucky Momma D and Da Boyz. The winner will have a choice of either the Playhouse or Clubhouse! Enter through the Rafflecopter widget below. It may take a minute to load! this is great! i can see my kids playing with the clubhouse for hours!!!! I agree. My boys love legos and this product would fit right in with their love of building and the way it can be made into other figures will work with their imaginations. The clubhouse because my kids would love that!! The Clubhouse! My son would loooove it! HE would spend hours in it! I would choose the Clubhouse since I have a son and daughter so they can both enjoy it. I would choose the play house! It would be so much fun, and the girls would LOVE it!! I'd choose the clubhouse because my boys would love it! Since I have boys like you I would choose the Clubhouse. I would choose the clubhouse as its first…for a boy. But…it reminds me of Autism…with the primary colors and almost looks like puzzle pieces. I would love this! I would love the clubhouse. The Clubhouse, because of the neutral, primary color scheme for any child. I'd pick the Clubhouse because my daughter just listened to a story about a boy who builds a clubhouse that she really enjoyed. I totally want that Clubhouse! I would pick the playhouse because my daughter loves to build but always has to build with my sons toys. 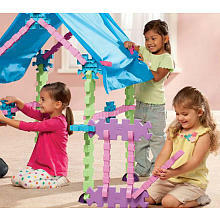 If I won, I'd choose the Playhouse because the colors would work with both boys and girls. Whoops – I was looking at the caption for the other picture. Correction: I'd choose the Clubhouse because those colors would work for both boys and girls.